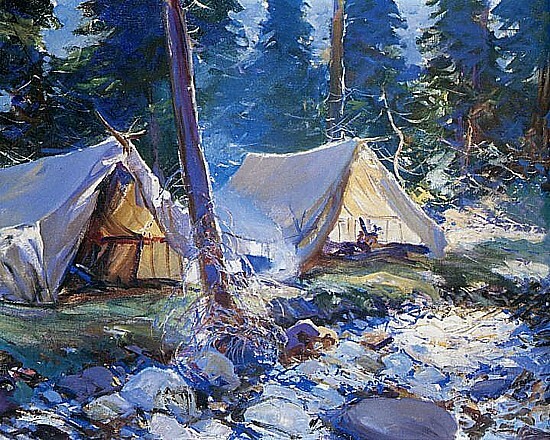 The Camp, Frank Weston Benson (my favorite). Very often in exploring the work of an outstanding, though lesser-known, artists, those paintings which constitute the main body of their work are not nearly as interesting to me as those which the artist painted for their own pleasure. In most cases, the vast majority of an artist work is done to please others--his or her clients. And, while it may be quite good, almost by necessity and definition it is also going to be pretty standard fare. At their best, they are an artist's "bread and butter." At their worst, they're sometimes referred to as "potboilers." However, when painters paint for their own enjoyment, they are usually painting for a client (themselves) with much more astute tastes and rigid demands. 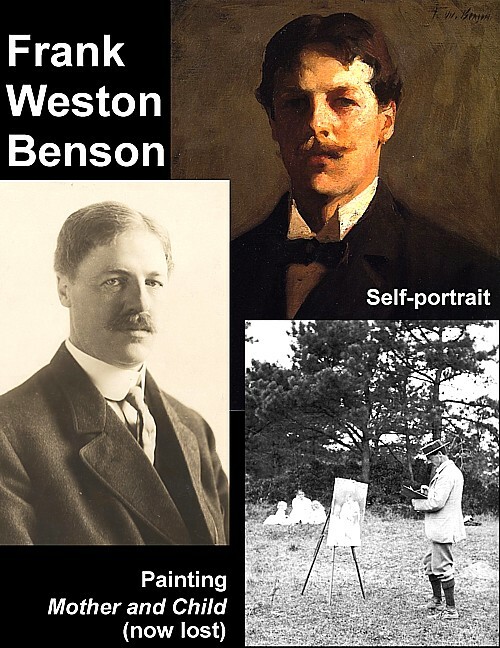 Frank Weston Benson was a New England portrait painter working around the turn of the century and into the early, turbulent years of the 20th-century. Moreover, he's a perfect example of the situation I just described. Painting for fun and profit. Frank W. Weston painted Realistic "society" portraits, American Impressionist paintings, watercolors, and etchings. He was born in 1862 the second of six children. He spent his entire life in and around Salem, Massachusetts (located on the coast, northeast of Boston). His father was a successful cotton broker, while his mother, Elisabeth Poole Benson, was from one of the founding families of the city. 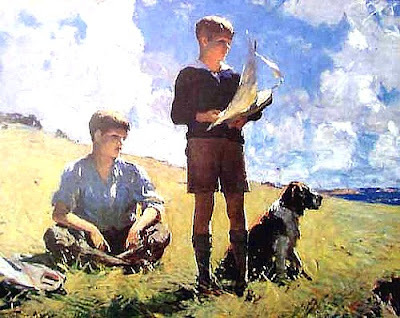 As a child Frank and his brother and sisters grew up in the out-of-doors sailing, hunting, fishing, roller skating, and (in Frank's case) sketching wildlife (mostly birds). Frank Benson began to study art in 1880 at the School of the Museum of Fine Arts, Boston, under Otto Grundmann, then in 1883 at the Académie Julien in Paris. As an ambitious young portrait artist, upon his return from Paris, Frank Benson set up his first studio in Portland, Maine, where he met and married a friend of one of his sisters. 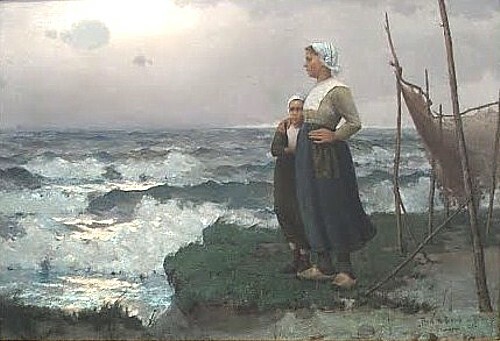 In his early years as an artist, Benson also painted in Dublin, and Newcastle, New Hampshire, as well as Eastham Massachusetts, where he taught a summer open-air painting class from 1893 to 1898. 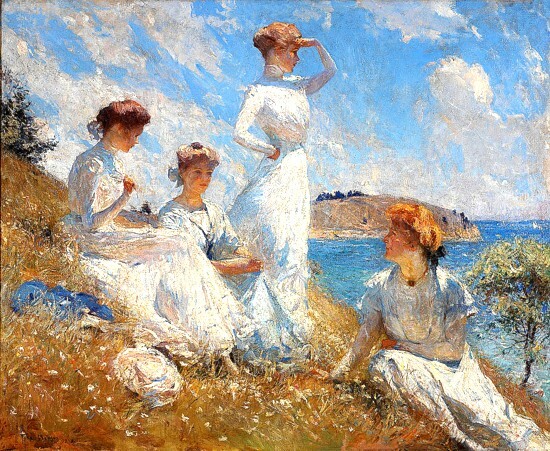 Summer, 1909, Frank W. Benson--his wife and three daughters. Around 1893 Benson, along with two of his brothers-in-law purchased a house on North Haven Island, Maine, as a hunting retreat. There, from around 1901, Benson spent summers with his wife and children. His first success as a portrait and figure painter, came as he began using interior and exterior compositions with his children as models. 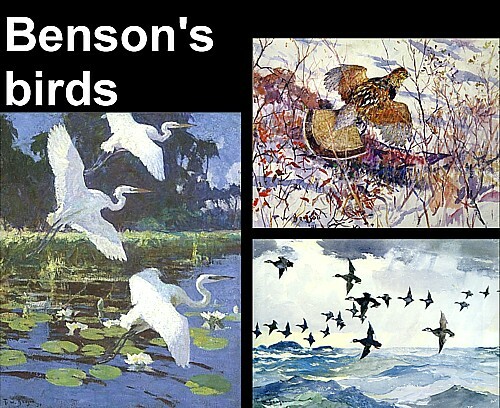 While he never abandoned this sort of painting, (after all, he had a family to support) around 1912 Benson began depicting game birds and waterfowl with greater frequency. In addition to painting in oils, he often drew in ink wash and composed in watercolor. painted to satisfy his male interest, dating from his boyhood. An avid birdwatcher and wildfowl hunter, as a teenager, Benson wanted to be an ornithological illustrator. At the age of 16, he painted Rail, one of his first oil paintings, after a hunting trip. Benson was influenced by a broad variety of European painters from the 17th-century Vermeer and Velázquez, to Monet, and his friends Winslow Homer, Edmund Tarbell and Abbot Thayer. In addition to painting portraits and indulging his artistic interest in painting birds, Benson also taught antique drawing at his alma mater, the School of the Museum of Fine Arts, Boston. There, in 1890, he became he head of the Painting department until his retirement in 1913.
were nothing more than a lucrative sideline. After trying to ply his trade as a portrait painter in various New England cities with various degrees of success, Benson, along with his friend, Phillip Little, opened a portrait studio in his hometown of Salem. Benson was not one to experiment with emerging styles or art movements such as Cubism, Expressionism, and Fauvism. Even as American Impressionism evolved into Post-Impressionism about 1913, Benson stayed with traditional genres and his American Impressionist style. As a result, His life as well as his art was pretty and genteel. Both were criticized by other artists and critics. His reaction was to turn to nature, and birds, which replaced women and children as his major objects of interest. From about 1920 on, we see more and more, as the halcyon days of that period freed from the threat of poverty, Benson gave over more and more of his time and energy to landscapes peopled with hunters and fishermen (above). Despite criticism Benson's portraits grew so in popularity he was able to open a Boston studio in 1888. In his role as a teacher, Benson's work as an artist led him to become a major influence in the American Impressionism. In 1898 Benson and nine other artists including William Merritt Chase, Thomas Dewing, Childe Hassam, and J. Alden Weir formed "Ten American Painters". Together they organized annual exhibitions of their works in New York City as well as Boston, and became known as the American Impressionists. The Traditional Fine Arts Organization praised Benson as one of the last great American Impressionists. Of all the painters of his generation, Benson was among the few to keep his work fresh and current with contemporary tastes. In the 1930s, when many of Benson’s fellow artists were retiring, critics were still describing Benson's work as “fresh and vital,” or as “contemporary” or referring to it as capturing “the essence of the life of today.” Few artists have had a career so long or so successful in so many media. Frank W. Benson died in November, 1951 at the age of eighty-nine. His father’s fears that he would become a “starving artist” were never realized. Benson became not only one of the most admired artists of his day, but was able to provide very well for his family through his art. Except for those works that Benson gave to friends and family, almost everything he created has been sold. To date, the highest price brought at auction for an oil painting by Benson is $4.1 million. About ten years ago, a watercolor by Benson brought $165,000 at auction.